Earlier, Morini had also manufactured motorcycles together with Mario Mazzetti under the name MM. Morini came under Cagiva control in 1987, then in 1996 came under Texas Pacific Group, which also had bought Ducati, and in April 1999, the rights to the name were purchased by Morini Franco Motori spa, a company founded by Morini's nephew in 1954. Alfonso Morini was born on January 22 1898. Before he was 16 he was repairing motorcycles, and at the age of sixteen, opened a workshop. This was just before World War I broke out. During the war he was with the 8th Motorcycles Unit, stationed at Padova. In 1925 Mario Mazzetti, impressed by Alfonso’s work, asked him to build a single cylinder 125 cc two stroke racing bike, making Alfonso the designer, constructor, and racer. They were successful racing, under the MM name, and Alfonso’s finest racing moment came in 1927 when his MM 125 took six world records at Monza, during the Grand Prix of Nations. (These records were not bettered for twenty years.) In 1933 he set a new world speed record for 175 cc motorcycles of 162 km/h. In 1937 Alfonso and Mario parted ways, and Alfonso Morini went into the production of 350 cc and 500 cc three wheelers, under the Moto Morini name. The government regulations favoured these lighter fuel efficient machines, and the successful Moto Morini M610 had advanced features, like cardan driveshafts. This was interrupted by World War II, and Moto Morini was converted to produce aeronautical components. In 1943 the factory was bombed. 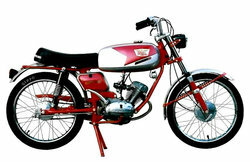 The impressive 1969 Morini Corsaro Regolarità 125 cc, one of the last small competitive Thumper produced. This model is still an icon in Italy. Undeterred, in 1946, a new three speed transmission, single cylinder, two stroke T125 emerged from the new Bologna factory, Via Berti. In 1947 a Sport version appeared. In 1948 Raffaele Alberti won the Italian Championship for Lightweight Motorcycles on a two stroke 125 Competition. In 1949 Umberto Masetti won the Italian Championship for Lightweight Motorcycles on a 125 SOHC four-stroke, that produced 12 hp @ 10000 rpm, and could exceed 140 km/h. In 1952 Moto Morini won races outside of Italy with the 125 SOHC four stroke, as Emilio Mendogni won both the Grand Prix of Nations, and the Spanish Grand Prix. In 1953 a 175 cc pushrod OHV four stroke model appeared in production. Models like Gran Turismo, Settebello, Rebello, Supersport, Briscola, Tresette, and Tresette Sprint also appeared. In 1956 Moto Morini moved to a larger production facility at Via Bergami. In 1958 Alfonso Morini, Dante Lambertini, and Nerio Biavati designed the 250 GP Double Camshaft. Ridden by Emilio Mendogni, it won the Grand Prix of Nations at Monza, taking the lead on the first lap, and keeping it. The 250 GP put out 37 hp @ 11,000 rpm and had a maximum speed of 225 km/h. In 1961 Giacomo Agostini began his racing career on a Moto Morini Settebello “Short Rods”, coming second at Trento-Bondone. Agostini was Italian Cadet Champion in 1962, and Italian Junior Champion in 1963. Tarquinio Provini, riding a Moto Morini 250 GP, won the Italian Championship in 1961 and 1962. In 1963 Provini convinced Alfonso Morini that they should try for the World Championship. They missed by 2 points. Honda won. On June 30 1969, Alfonso Morini died. He was 71. His daughter, Gabriella Morini, took over management, and would remain in control till 1986. In 1970 Franco Lambertini (unrelated to the earlier Dante Lambertini of Morini's technical staff) left Ferrari works and joined Moto Morini. In the early Seventies Moto Morini launched their first 72° V-twin motorcycles, designed by Franco Lambertini, and created by Franco and Gino Marchesini. They displayed a range of 144 kg 350 (actual capacity 344 cc) models, including Strada and Sport. In 1977 500 cc V-twin models (actual capacity 479 cc) emerged. (1) In 1981 a six speed model 500 became available. In November 1981 a 500 Turbo was shown at the Milan Show, producing 84 bhp @ 8300 rpm. It did not make it to production. An enduro version called the Camel 500 was released in 1981. In 1983 the Kanguro 350 was released. In 1986 Moto Morini brought out a cruiser version, the Excalibur, available in 350 and 500 versions. Harley-Davidson became interested in the Moto Morini V-twin as a smaller Harley, but had financial problems, and nothing came of it. The 350 was conceived as a modular design, and single cylinder versions were made. (Looking like the V-twin with the rear cylinder removed) These were the 1975 six speed 125 H and the 1978 250 T Mono, both unsuccessful, as was the later KJ 125 single of 1985. Sport 38 ps @ 8500 rpm, 32 ft·lbf @ 5100 rpm. The early Eighties did not go as well for Moto Morini, with labour disputes and diminishing sales. On February 18 1987 Gabriella Morini sold the firm to the Castiglioni firm, Cagiva. Despite their assurances that Moto Morini was important to them, the company was allowed to decline. In 1988 the Dart 350, a fully race faired version of the 72° V-twin, appeared. In 1989 the last enduro version, the Coguaro appears, in 350 and 500 versions, and another cruiser version, the New York, also in both capacities. These were extensions of other models, and little to no development was being undertaken. Franco Lambertini had a new 60° engine design, but Cagiva was not interested. In the same year as the last models appeared, he left Moto Morini, and went to Piaggio-Gilera. The Via Bergami factory was closed and by 1993 Excaliburs are assembled at Agostini works. In 1996 Ducati and the Moto Morini name are sold to TPG. There were no plans to revive Moto Morini. In 1999 Morini Franco Motori spa bought the Moto Morini name. Morini Franco Motori spa was founded in 1954 by Franco Morini, Alfonso's nephew. A new joint-stock company was officially presented in 2003, and the principal Moto Morini SpA shareholders were the Berti and Morini families. 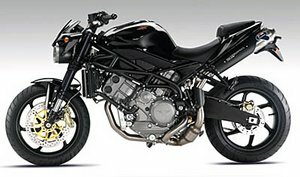 In 2004 a new motorcycle was announced, the Corsaro 1200 naked bike, which appeared in 2005. It was followed by the "9 1/2" road bike. There have been criticisms of the computerised fuel injection mapping in these early models. They are both powered by an 1187 cc Bialbero CorsaCorta 87° V twin-cylinder engine that develops 140 bhp @ 8500 rpm, and 123 nm at 6,500 rpm, in the Corsaro, and 105 bhp at 8000 rpm in the 9 1/2. The engine was designed by Franco Lambertini. The engines are tuned differently to suit the different applications. On 10 October 2006 a Corsaro Veloce 1200 was announced. (1) "Italian Motorcycles " Number 4. (magazine), Page 56 Article, The Bologna Alternative by Finn McCoul , Federal Publishing, 1997.